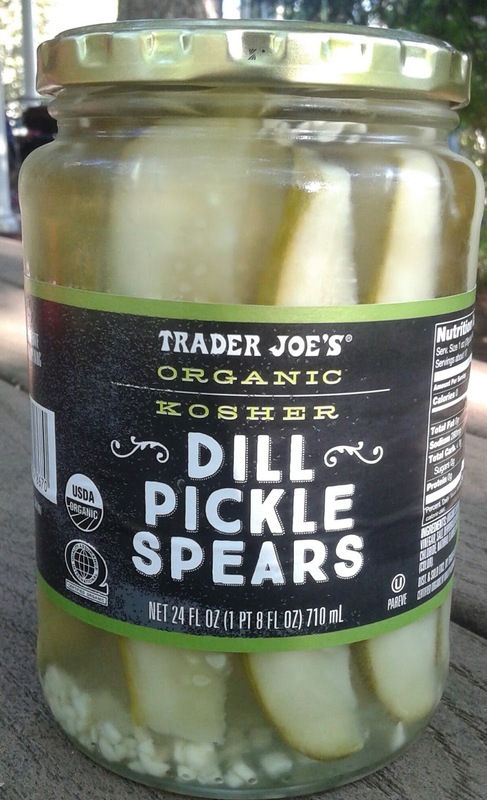 You'll never see me purchase a jar of pickles, even with the recent debut of Trader Joe's Organic Kosher Dill Pickle Spears. It's not me - it's the family. Sandy refuses to touch, let alone attempt to consume, anything like a pickle, or even anything that's even touched a pickle - this had led to some interesting dinner time dill-emmas and dissections when out at a restaurant. Best case scenario: I get an extra pickle! Worst case: Waitstaff eyerolls abound. As for our toddler, Lil Ms. M.? Well, in her words: "I wicked a pick-kull once but I didn't wike it." That's a true story, I wish I would have captured that grimace for all of time. Baby B, who's started eating some table food, has tried a pickle and seemed to like it; then again, she somehow got a hold of a lemon slice and loved it, so I think she's still honing her palate. I mean, she also likes rocks, for goodness sake. So, I'm grateful for my brother and sister-in-law, and their kiddos, all of them pickle aficionados, for dropping the $2.39 at TJ's for a jarful right before we came over for a Labor Day grill out. That way I got to try them without plopping down the cash, knowing it'd probably ultimately go to waste since I'm the only one in the household who would touch them. Alright, so anyways....yeah, a jar of pickles isn't as flashy or eyecatching as, say, bags of pickley popcorn that all of you seem to love. I mean, there's not all that much one can do to a pickle to make it stand out all that much, is there? That's probably right, but...these do seem a little different than most I'm used to. There's a little added sweetness that must be from the cucumbers themselves - it's not overpowering, or even completely obvious, but to me, it's there. Most cucumber bases for pickles either taste like a pretty straightfoward cuke - kinda bland in a wholesome way - or get over-saltied or vinegaried. Not these. The dill and garlic are also there as a good accompanient but aren't all that dominant, either. Instead, these pickles just taste good and fresh, with a crunchy, firm bite. Eat right from the jar or snuggle up in a bun with a hot dog, these guys are good to go. That being said....There's a particulary perplexing pickly problem here, especially if you're a serving size stickler. Look at it: A serving is 3/4th's of a spear. What!?!?!?! 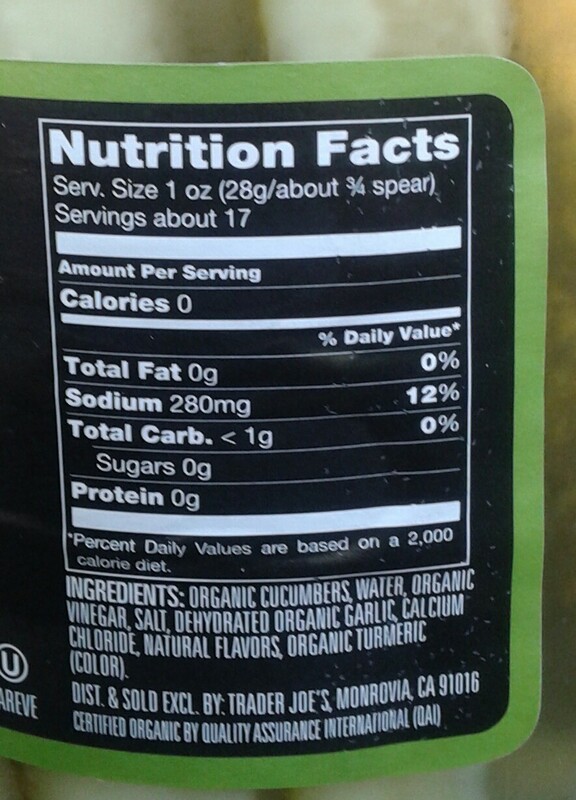 The only reasonable explanation is the sodium - if my math isn't too fuzzy, if 3/4ths a spear is 12% of suggested sodium intake, a full spear is 16%, and just maybe that number would scare off too many potential suitors. I call shenanigans on that. Look: No one's going to lop off a little middlin' pickle stub. You're going to eat one, if not more. 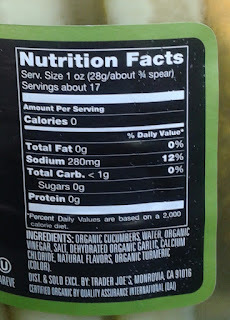 And pickle people know what they're into when it comes to pickles and sodium - there's a lot of it. We deal with it. Don't jerry-rig the serving size to make them appear to be not as salty as they are. It strikes me as dishonest. Aside from that, no real complaints here. It's as good a jarred pickle as any out there, unless you're one of those silly ones who prefer bread-and-butter pickles (ick) or whatnot. The consensus of the pickle choir around the picnic table, young and old, was that these were a worthwhile pick-up, maybe not quite as good as fresh made deli pickles, but for a shelf-stable-til-opened jar, pretty good. I'll take some liberties in score guesstimating, but I'm probably not too offbase. Given that you're not likely to eat a "side order" size of pickles on a daily basis, that they are an occasional treat, I wouldn't worry about the sodium. I plan to try them..I like a nice, Kosher Deli-type pickle with serious "crunch" so, waiting to see if these convince me ...22 days till their opening in Birmingham!!!! Yeah, not worried either, but the labeling on them seemed a little shady, 'tis all. "unless you're one of those silly ones who prefer bread-and-butter pickles (ick) or whatnot." This had me rolling! My husband and I just had a conversation where we deduced no one we know prefers bread and butter pickles. Glad to see we're on the same page! I want to check these out as a pickle fanatic! Haven't had these, but TJ's anwich pickle slices (sliced the long way, not little circles) are great. Nice crunch, lots o flavor, great for slapping in a sandwich! BTW, as an aside, fears of sodium/salt levels are overblown and largely debunked. The original hypothesis was based on a simplistic application of basic osmosis concepts to blood--doesn't work that way in the real world. Ahem, Bread & Butter pickles ROCK! Just sayin' ;) I love pickles of any kind (except TJ's gherkins). Thanks for the head's up on these, I hadn't noticed them in the store yet. As for the serving size, it's also listed as "1 ounce", so maybe that's some label regulation they're having to follow (rolling eyes here, too). Tanya, I'm so with you on the B&B pickle thing . If you're really all that concerned about the sodium you can always rinse the pickle juice off the pickle under running water. This will bring the sodium down. How can a pickle lover not finish a jar of pickles? I'd eat this little thing in no time! The serving size has a lot to do with calories; anything less than 5 per serving can be listed as zero! Yep, that'd be my guess for the weird serving size too. Love pickles, but only fresh, crisp, bright green half-sours. Half cuke, half pickle. Will pass on these. The serving size is based off 1oz even which happens to equal approximately 3/4 of an average spear. It has nothing to do with the sodium. Horrible, almost sweet pickle, taste.